But before we get into that, welcome back! It’s been a few months since our last issue, and even longer since our last column. We’re both back now and I for one am extremely eager to learn what happens next in Ellis and Hunt’s two-years-running story. 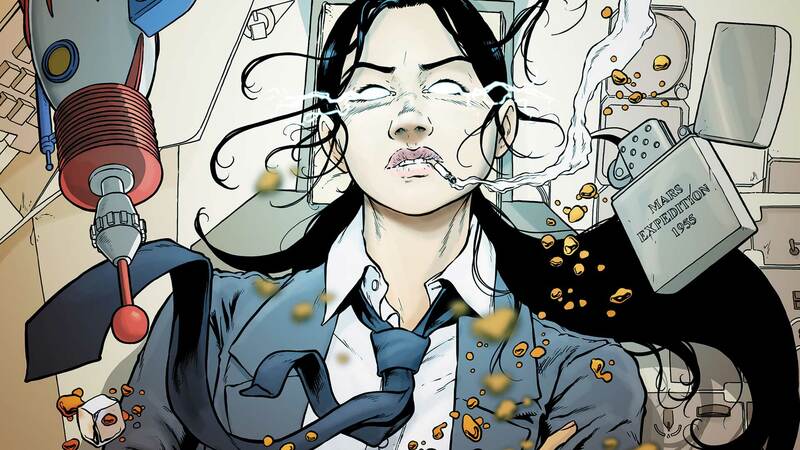 If you were confused about exactly what was going on in the world of The Wild Storm—and let’s be honest, there’s a LOT going on—THE WILD STORM #19 seemed to provide some clear, if still pretty complex, answers regarding Earth’s hidden extraterrestrials. Unsurprisingly, some details were left out. I’m pretty curious about the five different Kheran species, myself, though I’d imagine long-time WildStorm fans are probably already familiar with them. However, it’s hard to deny that issue #19 marked a real turning point for The Wild Storm. While the series has been pretty clear on IO and Skywatch, and why the two mega-powerful organizations seem to hate each other, we weren’t clear on what Jacob Marlowe’s deal was. Now that we know, I’m not sure what to think. It’s something I’m going to have to consider for a while because like everything else in this series, it’s not so black and white. With his initial expedition a failure, Marlowe—or Emp, as we should probably call him—took on a new mission, to help elevate the human race to a level that he feels would allow them to share the galaxy with the Khera. The problem with that mission is pretty obvious. While Emp seems to want to help the human race—and in fairness, all of his actions during the series seem to support that claim—he has a very self-centered, self-serving reason for doing so. It begs the question about whether he can truly be trusted. Is this truly a case where we both benefit? It may be better than his original mission of turning the human race into a subservient race under the Khera. But wouldn’t we have been better off if the Khera had never come? Wouldn’t the truly kind, respectful thing for Emp to do be to leave? That’s just one of the many nuances in this history that issue #19 reveals. I’ll admit to being TOTALLY off-base regarding the Daemon. I didn’t know what their interests were or what they were doing on Earth, but it sure didn’t seem good to me. Now, it appears that they’re here to help (though, I suppose the same questions we asked about Emp’s mission can also be asked of the Daemons’). We got our first hint of the Daemons’ activities back in issue #8, during Shen Li-Min’s journey through Jenny Sparks’ mind. Of course, I say “hint,” but the truth was it was all there. We saw shades of Jenny’s past, which we now know goes back a very long time. And we saw the bizarre Shaper Engine, the machine the Daemon use to help get us through the destructive Gaian Bottleneck. Of course, I had no idea what the heck it was at the time, or why it was surrounded by Daemon who could seemingly sense that Shen was there. However, it makes sense now. Well, more sense now, at least. Let’s talk about the Gaian Bottleneck a moment since it’s come up several times in the series. First, it’s a real theory. Ironically, some scientists believe it’s why we haven’t been visited by aliens here on Earth. As The Wild Storm discusses, our universe is hostile, and life is usually too fragile to survive for the billions of years that it takes to evolve into something advanced. And if you’re thinking the human race is in the clear, think again. You’d have to ask a scientist to specify what exactly “advanced” means in regard to life, but I’d imagine it means that a lifeform has evolved to the point where galactic or environmental events can no longer pose an existential threat to it. Human beings may have accomplished a lot and have survived for a pretty good stretch, but it all could end in an instant with an asteroid collision, super-volcano eruption or nightmare virus. But in the world of The Wild Storm, none of those seem like the likely culprit. Humanity’s destruction seems far more likely to come about as a result of IO’s escalating war with Skywatch. Which gives us one hell of a question to ponder. The Kherans originally came here to use the human species as a way of escaping the Gaian Bottleneck. Yet, it’s Kheran technology that gave rise to Skywatch and IO, which now seem on the brink of destroying most, if not all, human life. So, in trying to escape the Gaian Bottleneck, did Khera doom our world to it? THE WILD STORM #19 by Warren Ellis, Jon Davis-Hunt and Steve Buccellato is now available in print and as a digital download. Tim Beedle writes about comics, movies and TV for DCComics.com. Look for him on Twitter at @Tim_Beedle.